Posts tagged with "For Everybody"
Today, Detroit rapper and rising hip-hop MC Kash Doll shares the visuals for her single “Ice Me Out”. The video showcases Kash Doll’s versatility, whether she’s toying with life size hand carved male ice sculptures or wearing the limited-edition jewel adorned Versace boots – she knows exactly how to get your attention. She wrote “Ice Me Out” for women who can do the same! Earlier this year, Kash Doll released a project solely for her fans titled “Brat Mail” to thank them for all their continued support. The project garnered over 13 million global streams and features the break out single “Check”. Shortly before “Brat Mail,” Kash released one of her biggest singles to date, “For Everybody” which racked up 10 million YouTube/VEVO views independently. Coming from Motor City, Kash Doll first bubbled up in 2014 with a remix of Tinashe’s “Too On” which received airplay on local radio stations. Shortly after, her single “Run Me My Money” went viral and paved the way for the release of her mixtape Keisha vs. Kash Doll which exceeded over 600,000 downloads in the first two days. A child of hip-hop, she immediately became a regional favorite, generating millions of streams and packing shows. She started exploding with “For Everybody” in 2017 and was awarded the BMI Social Star award. In 2018 she made headlines by winning the “Issa Wave” Award at the 2018 BET Social Awards. Watch her acceptance speech and a fiery performance of “For Everybody.” She’s definitely proven herself as an artist to watch. This entry was posted in Fashion + Music and tagged 360, 360 Magazine, apple music, BET, BET social awards, Brat Mail, check, For Everybody, ice me out, iTunes, Kash Doll, Keisha vs. Kash Doll, Madison Smushkevich, music video, soundcloud, spotify, Vaughn Lowery, vevo, visual, YouTube on November 7, 2018 by wp360mag. KASH DOLL DROPS NEW SINGLE “ICE ME OUT”. ANNOUNCES SIGNING TO REPUBLIC RECORDS. New York, NY — Following a series of mixtapes, Detroit the rapper and rising hip-hop MC Kash Doll shares her brand new single “Ice Me Out” today. 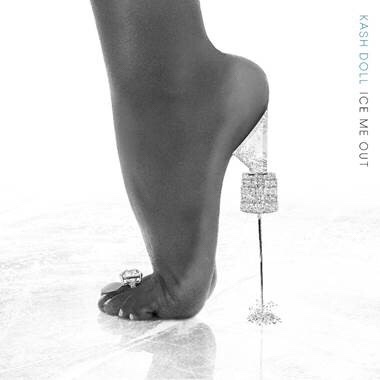 “Ice Me Out” kicks off what promises to be the biggest chapter of Kash’s already accomplished career as she ignited a high-profile partnership with Republic Records. Independently, Kash Doll has built a dedicated fan base with the help of social media despite having everything stacked against her. With Republic she’ll take her music to the next level, giving her fans and admirers exactly what they’ve been waiting for. Earlier this year, Kash Doll released a project solely for her fans titled “Brat Mail” to thank them for all their continued support. The project garnered over 13 million global streams and features the break out single “Check”. Shortly before “Brat Mail,” Kash released one of her biggest singles to date, “For Everybody“ which racked up 10 million YouTube/VEVO views independently. Coming from Motor City, Kash Doll first bubbled up in 2014 with a remix of Tinashe’s “Too On” which received airplay on local radio stations. Shortly after, her single “Run Me My Money” went viral and paved the way for the release of her mixtape Keisha vs. Kash Doll which exceeded over 600,000 downloads in the first two days. A child of hip-hop, she started exploding with “For Everybody” in 2017 and was awarded the BMI Social Star award. In 2018 she made headlines by winning the “Issa Wave” Award at the 2018 BET Social Awards. Watch her acceptance speech and a fiery performance of “For Everybody.” She’s definitely proven herself as an artist to watch. This entry was posted in Uncategorized and tagged 13 millions global streams, 360, 360 Magazine, BET social awards, Brat Mail, check, entertainment, For Everybody, ice me out, Issa wave, Kash Doll, Keisha, music, music industry, new drop, new single, nyc, out now, Pauline Huynh, Republic Records, run me my money, tinashe, Vaughn Lowery on August 24, 2018 by wp360mag.